The Chinese, state-owned Vanlead Group, Southern China’s largest tyre manufacturer and a major international tyre industry player has signed a memorandum of understanding (MoU) with Enviro. The agreement is the first step in the process of creating a turn-key recycling plant in China – construction is slated to start in 2017. “Vanlead wants to take the initiative in the industry and use Enviro’s reclaimed carbon black material in its tyre production on a massive scale. A first plant is currently on the drawing board. 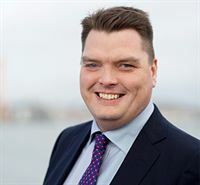 This plant will have the capacity to handle 30,000 tonnes of tyres every year and will supply Vanlead’s various production units across China,” says Enviro CEO Thomas Sörensson. Enviro’s CEO Thomas Sörensson and Mr. Fu, Chairman of Vanlead Group signs MoU for a new recycling plant. 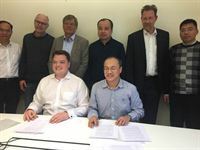 Enviro has signed an MoU with the Vanlead Group as a first step towards creating a new recycling facility in Guangdong in Southern China. The agreement is the outcome of positive results from demanding tests of rubber mixtures intended for tyres that the Vanlead Group performed on Enviro's materials over a period. “The intention of both parties is to start building a turn-key recycling plant already in 2017. Our ambition is to conclude the negotiations over the summer. 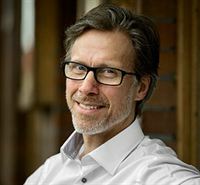 The plant will follow the basic design that we developed with ÅF and that is now ready,” Sörensson says. “I’m convinced that Enviro’s unique production technology for sustainable materials is the future for the tyre industry,” says Mr Fu Shoujie, Vanlead Group Chairman. The Vanlead Group's activities span multiple business areas, where tyre production represents a strategic area both domestically and internationally. The company is one of the world’s largest tyre manufacturers and exports tyres to both Europe, the United States, and other parts of the world. Enviro recently reported that yet another major, internationally leading tyre producer had achieved positive results from their tyre rubber materials tests. “Lately, we’ve received positive feedback from several international tyre producers that have performed tests on our reclaimed carbon black material. China is the world's largest market for tyres, rubber, and carbon black; there is great awareness that raw materials are limited; and state-owned Vanlead is the first to exhibit this high level of ambition. These are all positive indicators,” says Sörensson, CEO of Enviro. This information is information that Scandinavian Enviro Systems AB (publ) is required to publish under the EU regulation on market abuse. The information is provided under the auspices of the contact person listed above for publication on March 29th 2017 at 13:35 CET. Lately, we’ve received positive feedback from several international tyre producers that have performed tests on our reclaimed carbon black material. China is the world's largest market for tyres, rubber, and carbon black; there is great awareness that raw materials are limited; and state-owned Vanlead is the first to exhibit this high level of ambition. These are all positive indicators.